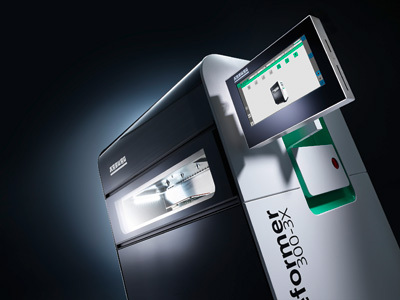 September, 21, 2018 - At the Formnext, to be held from 13 to 16 November 2018 in Frankfurt am Main, Germany, Arburg (www.arburg.com) will be celebrating a world premiere with its Freeformer 300-3X. The new large machine will process three components using the Arburg Plastic Freeforming (APF) process, enabling the industrial additive manufacturing of complex functional parts in resilient hard/soft combinations with support structure as a world first. In addition to the new "big version", two proven Freeformer 200-3X machines will be on view. At the Arburg exhibition stand E70 in hall 3.1, trade visitors will also be able to view more part samples before and test them for themselves at four interactive stations. A German family-owned company, Arburg is one of the leading global manufacturers of plastic processing machines. The product portfolio encompasses Allrounder injection moulding machines with clamping forces of between 125 and 6,500 kN, the Freeformer for industrial additive manufacturing and robotic systems, customer and industry-specific turnkey solutions and further peripheral equipment. Arburg is represented by its own organisations at 33 locations in 25 countries and by trading partners in more than 50 countries.